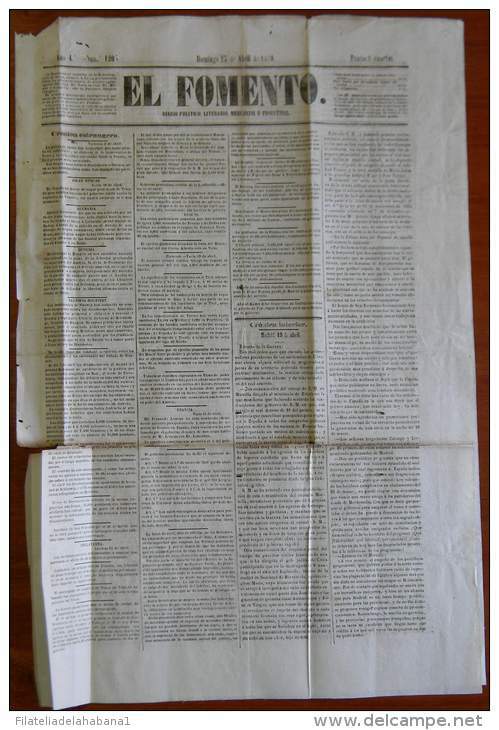 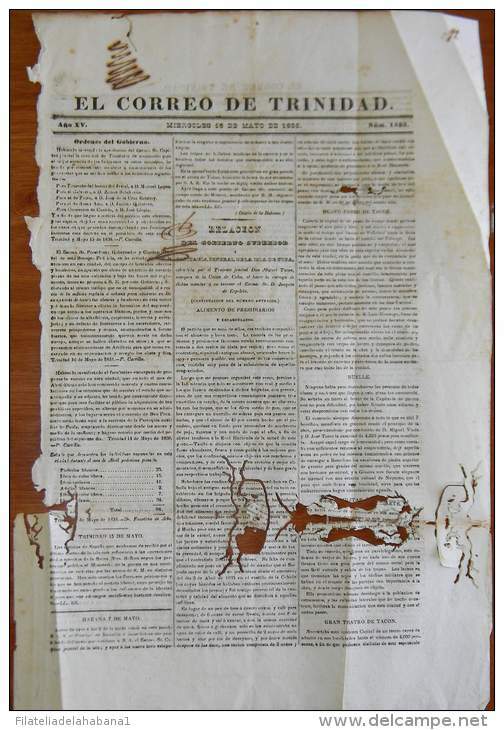 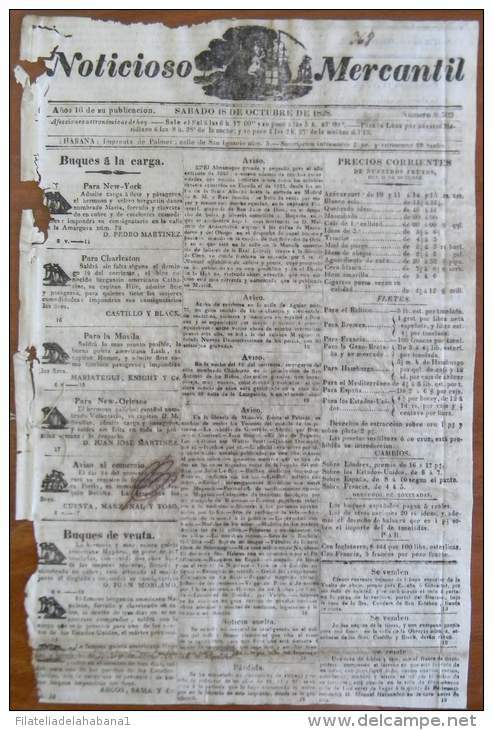 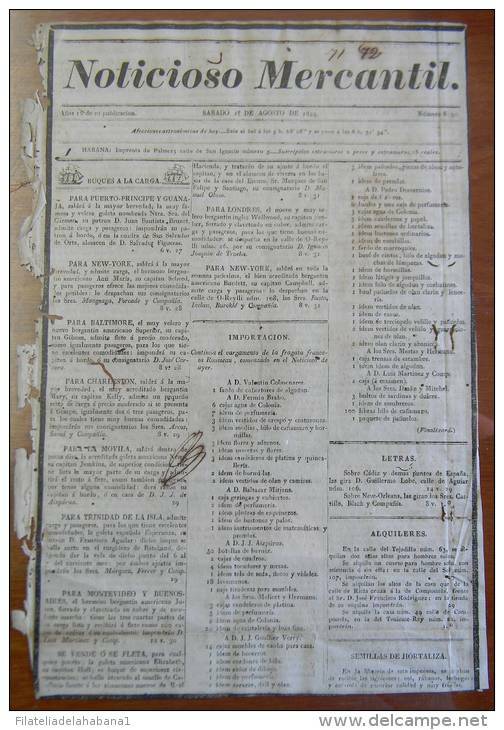 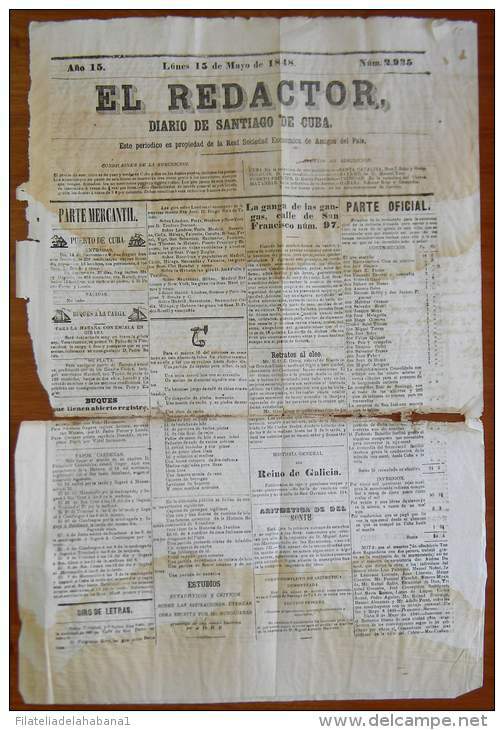 BP259 CUBA SPAIN NEWSPAPER ESPAÑA 1855 PRENSA DE LA HABANA 23/02/1855 46X32cm. 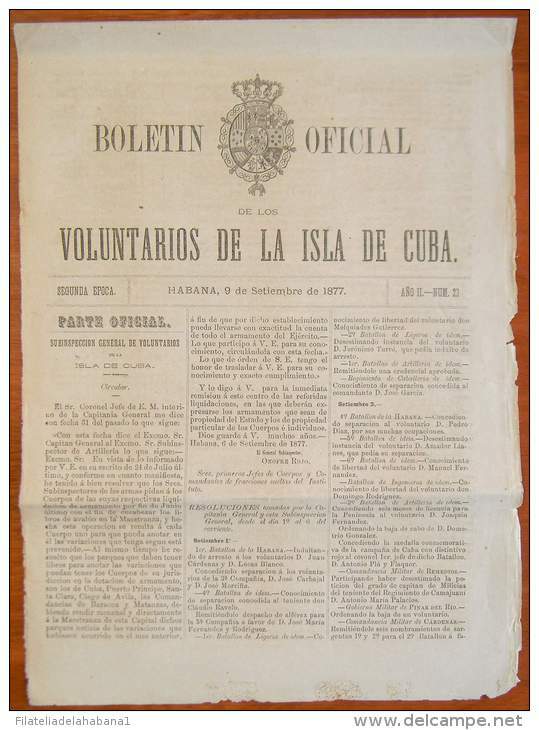 BP257 CUBA SPAIN NEWSPAPER ESPAÑA 1833 DIARIO DE LA HABANA 09/12/1833 53X32cm. 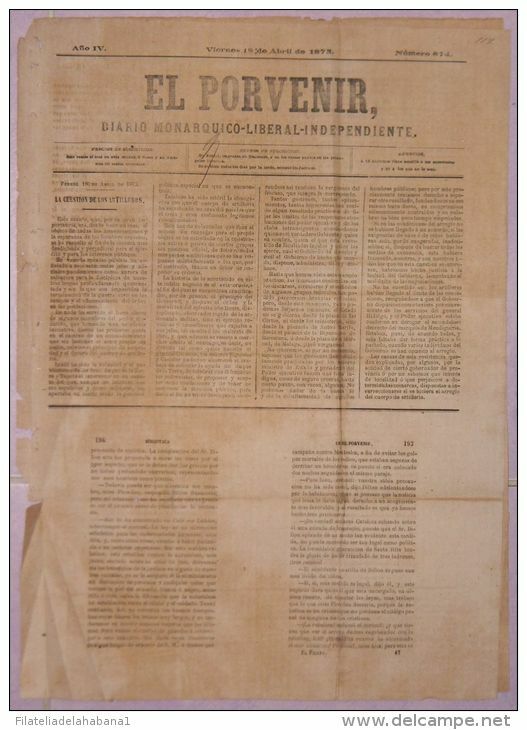 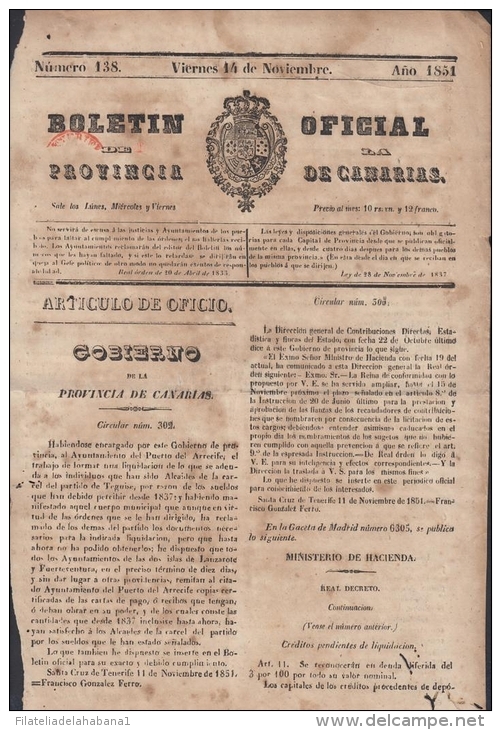 BP256 CUBA SPAIN NEWSPAPER ESPAÑA 1824 NOTICIOSO MERCANTIL 09/10/1824 39X28cm. 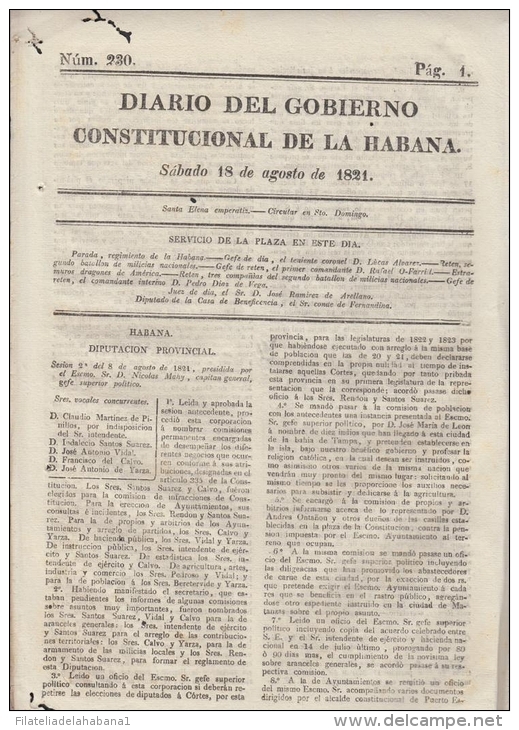 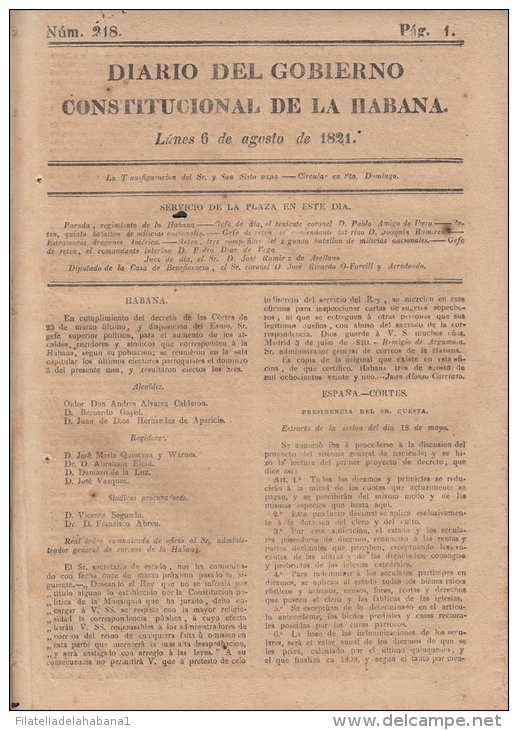 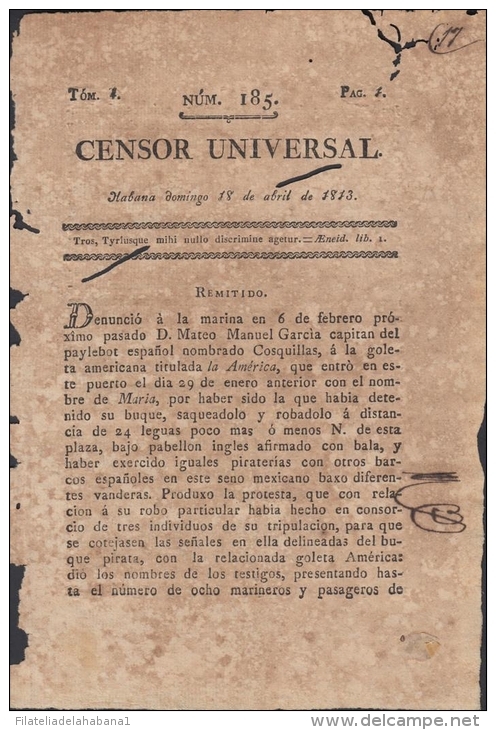 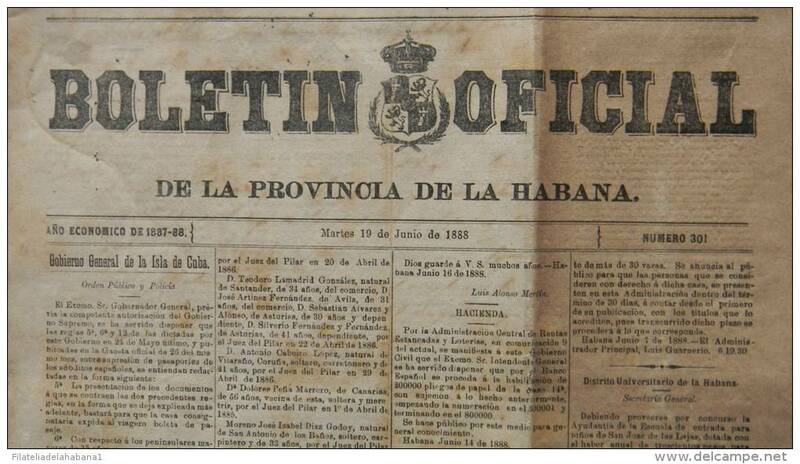 BP236 CUBA SPAIN NEWSPAPER ESPAÑA 1816 DIARIO DE LA HABANA 22.03.1816 31x19. 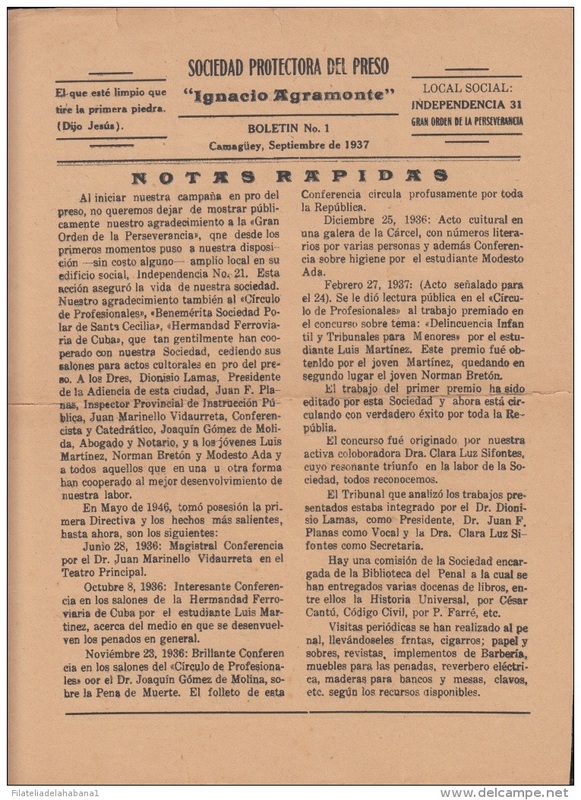 BP235 CUBA SPAIN NEWSPAPER ESPAÑA 1816 DIARIO DE LA HABANA 24.03.1816 30x19 cm. 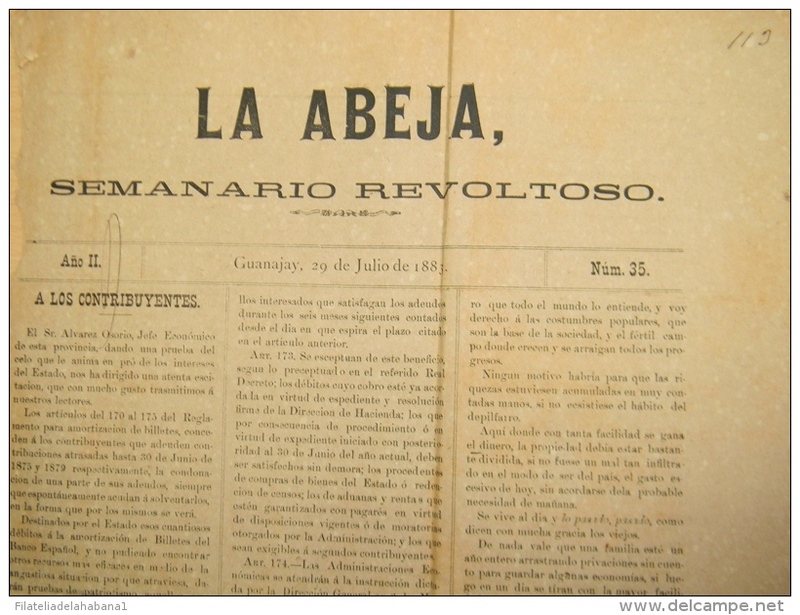 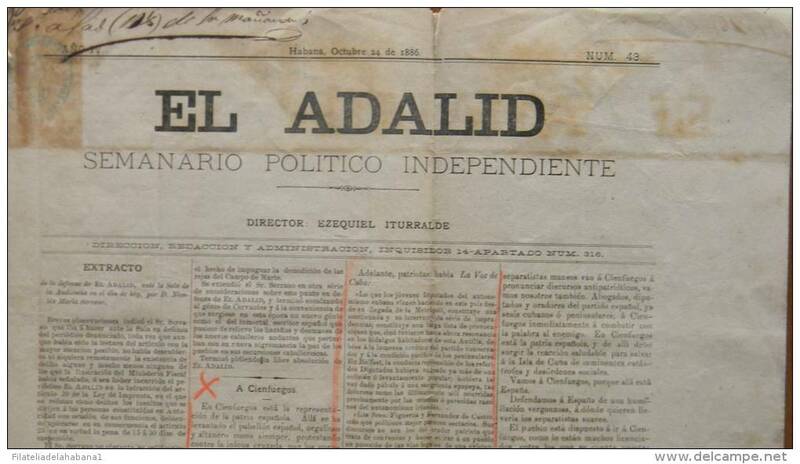 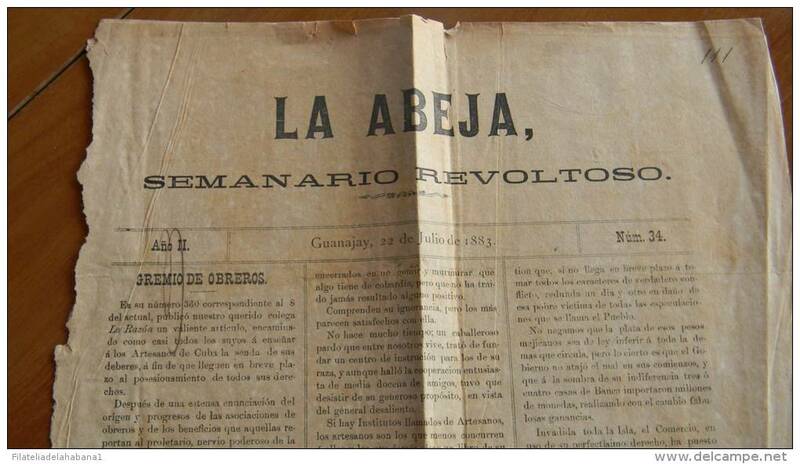 BP234 CUBA SPAIN NEWSPAPER ESPAÑA 1883 LA ABEJA 29/07/1883 45X30cm. 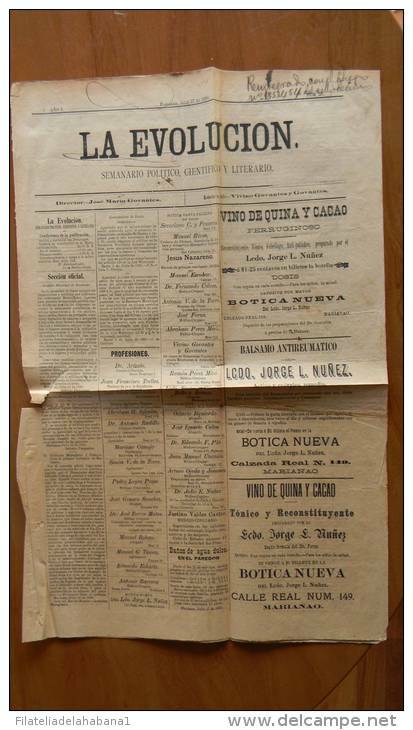 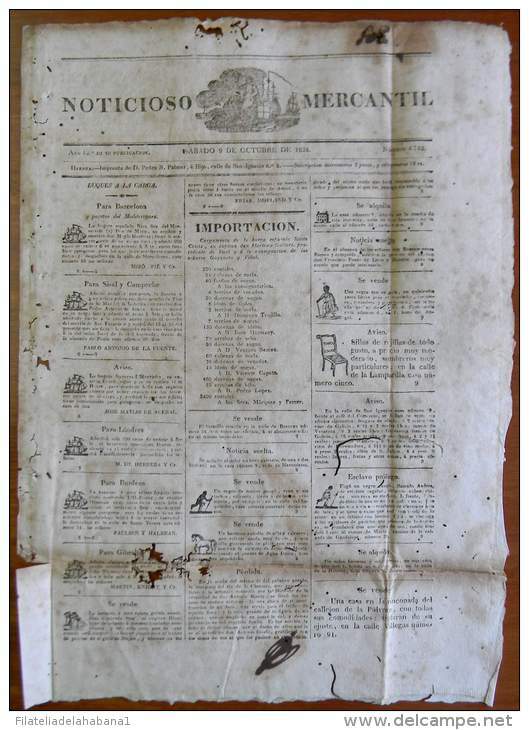 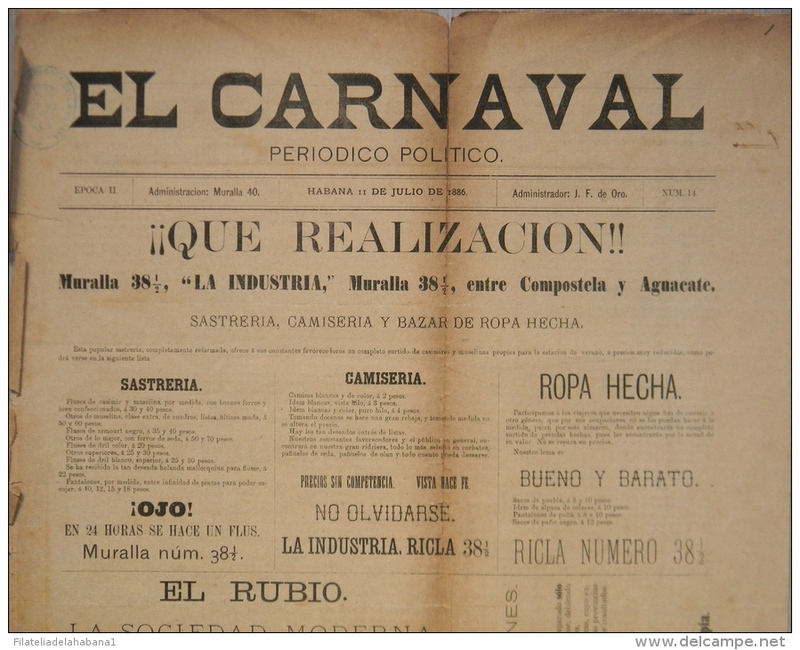 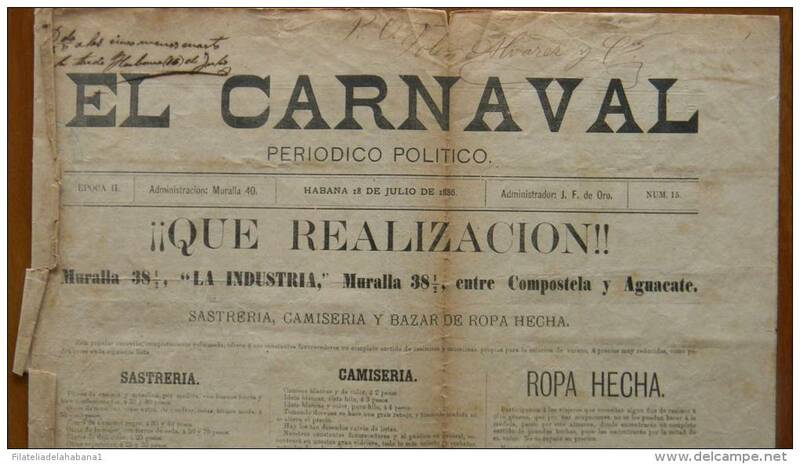 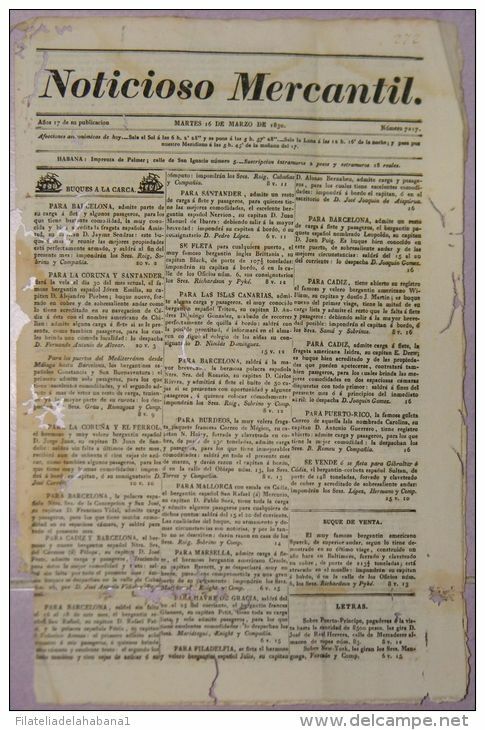 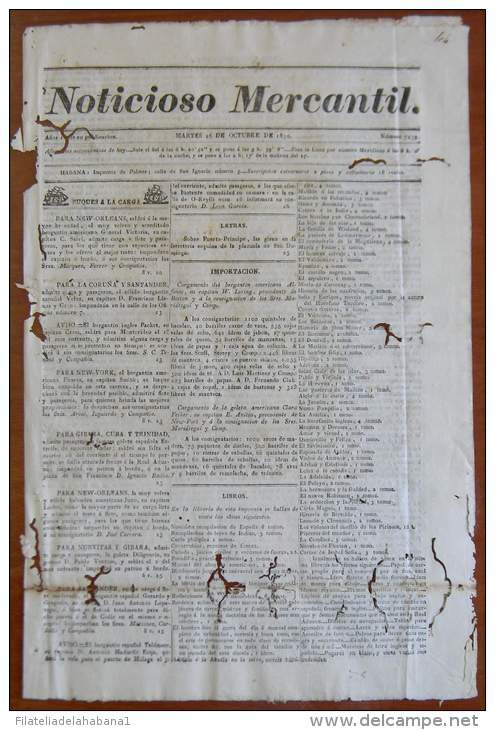 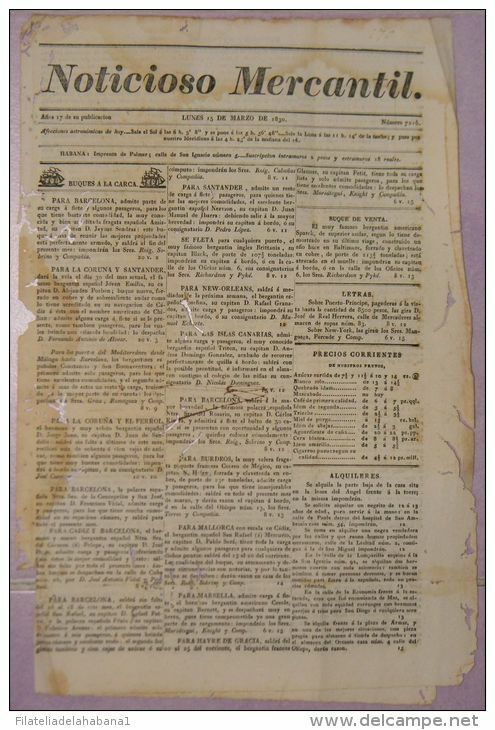 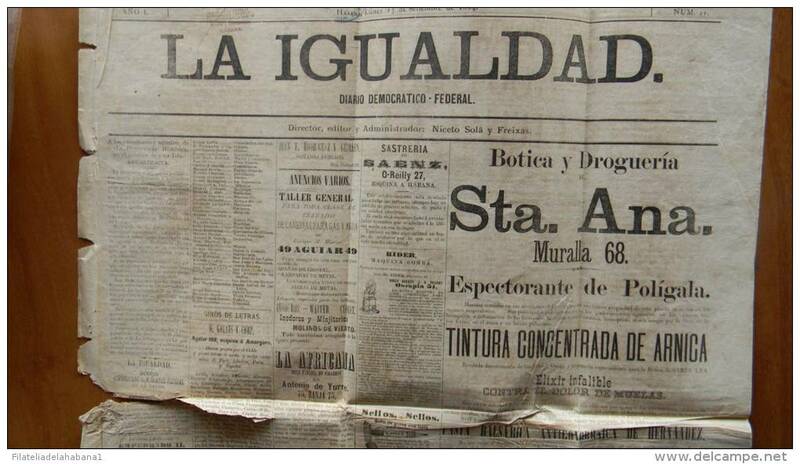 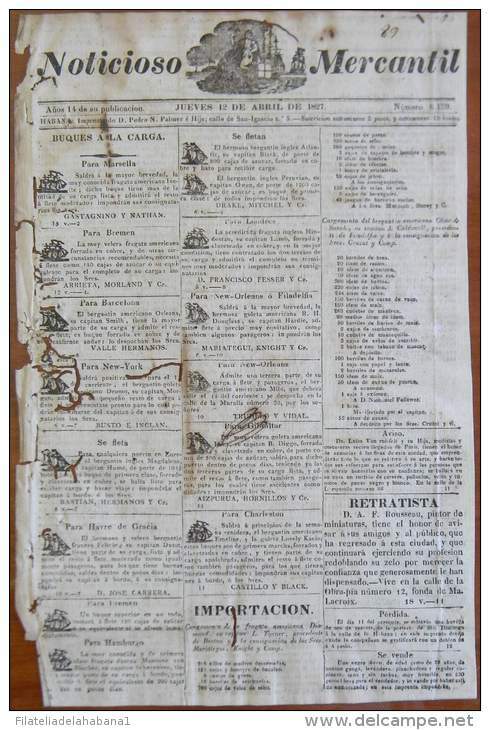 BP206 CUBA SPAIN NEWSPAPER ESPAÑA 1886 \"EL CARNAVAL\" 11/07/1886. 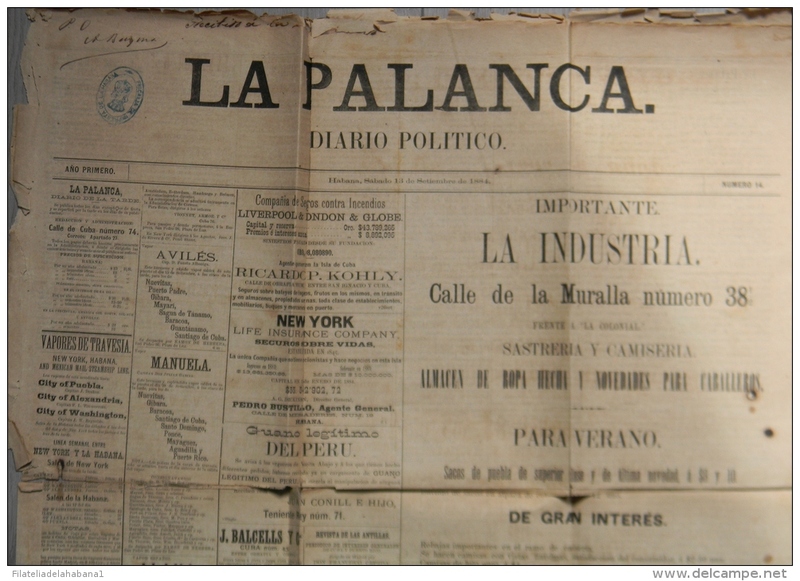 56X37cm. 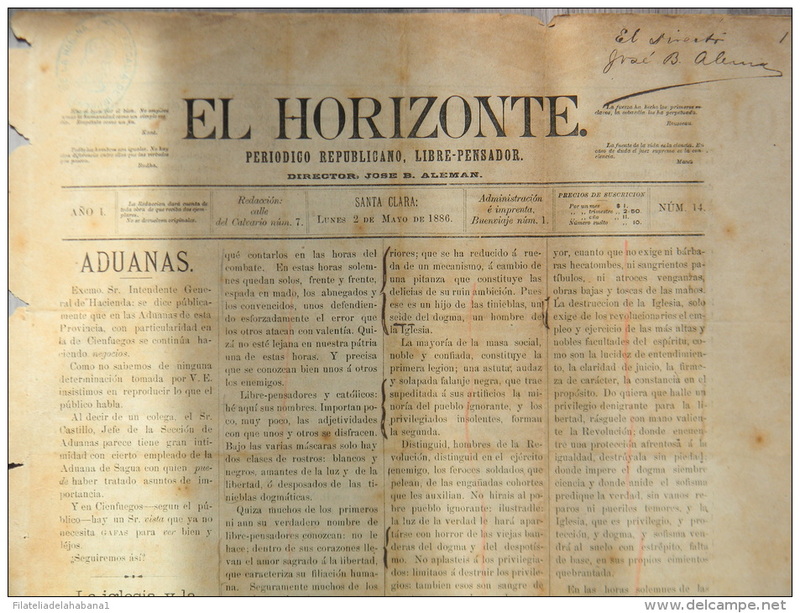 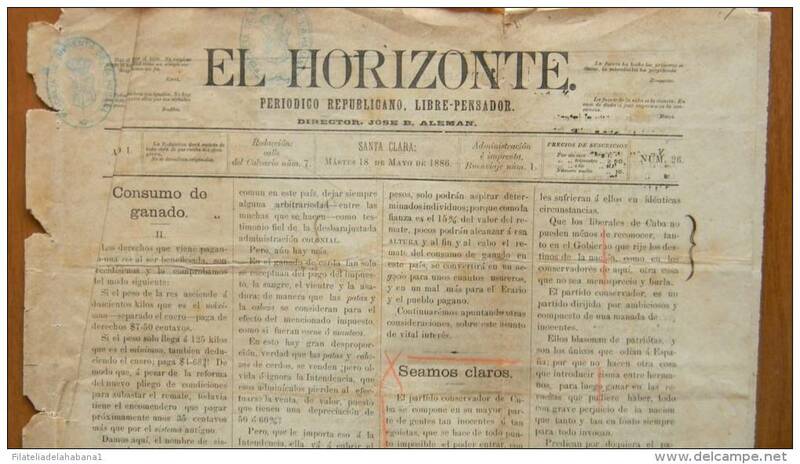 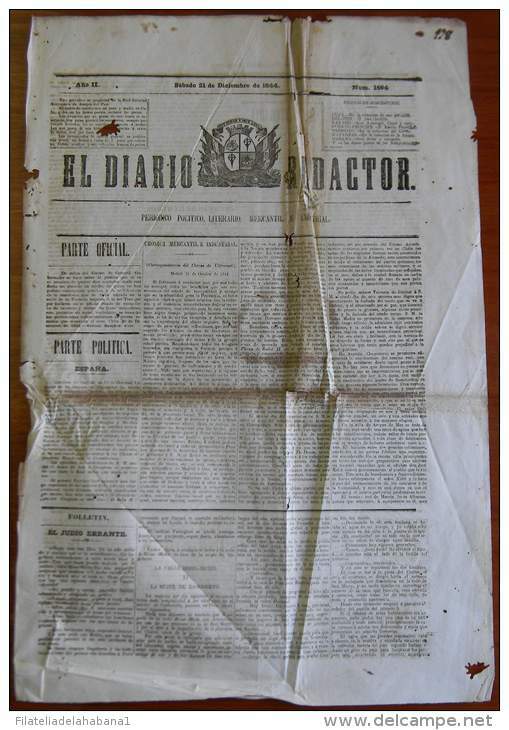 BP204 CUBA SPAIN NEWSPAPER ESPAÑA 1902 \"EL COMBATE\" 16/11/1902. 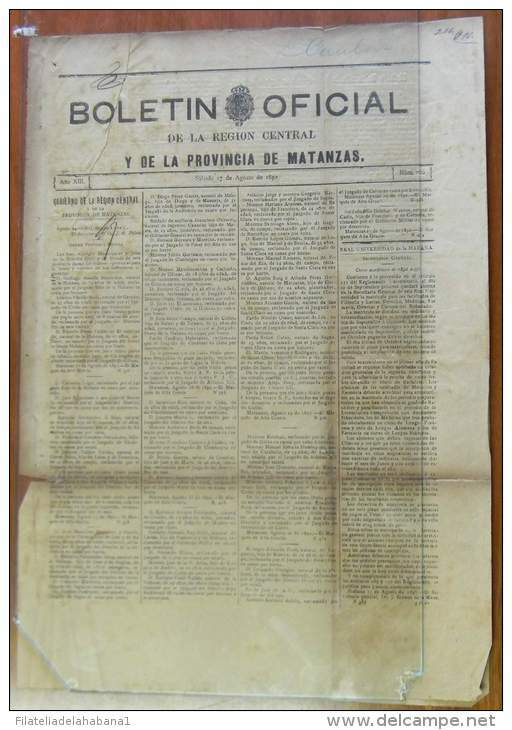 56X37cm. 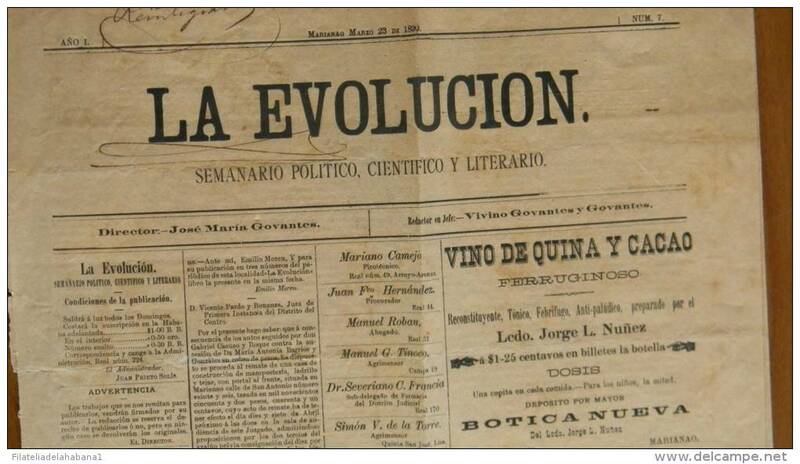 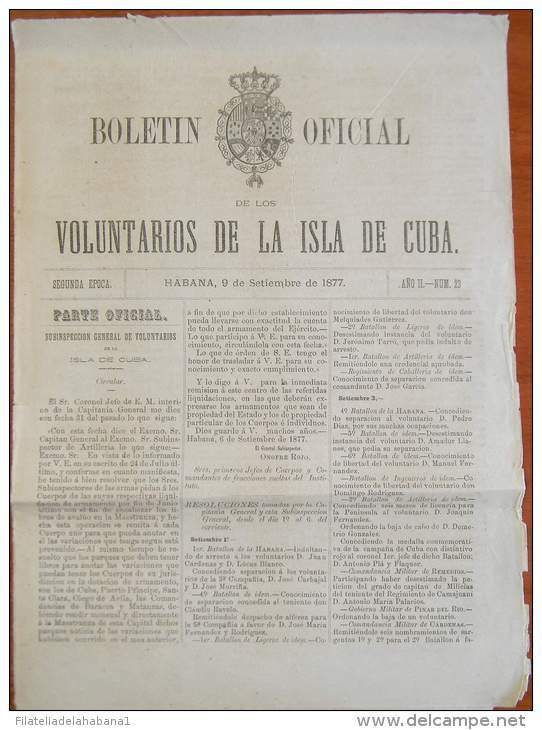 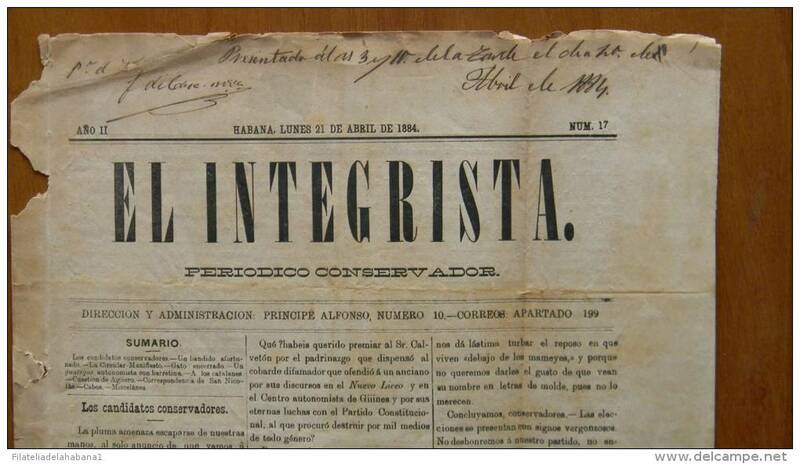 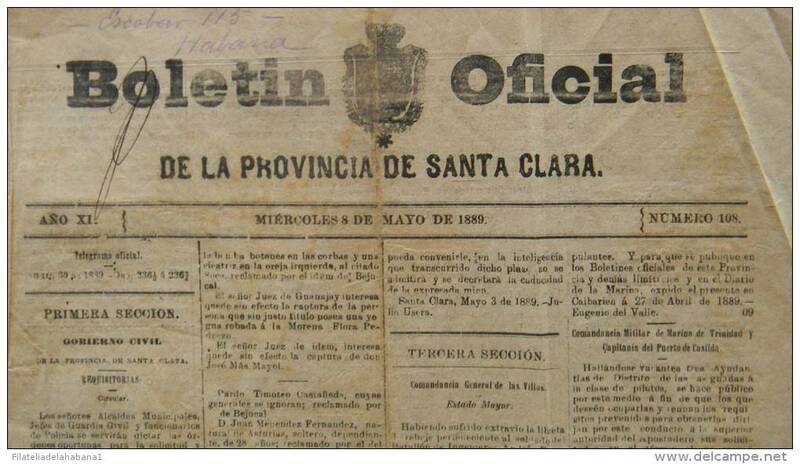 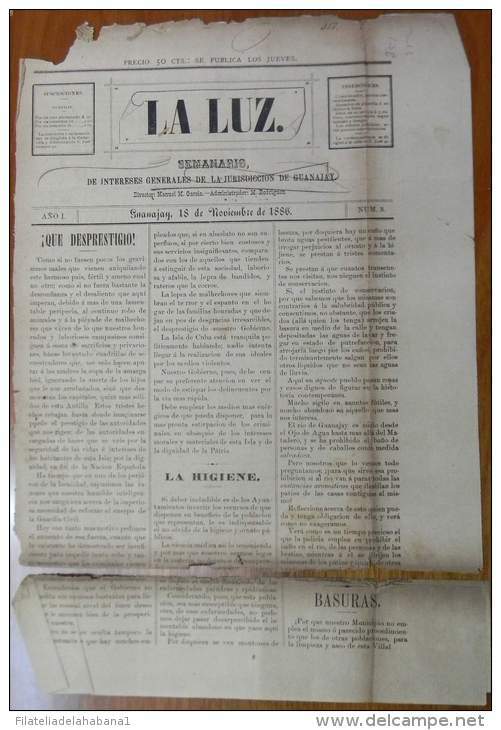 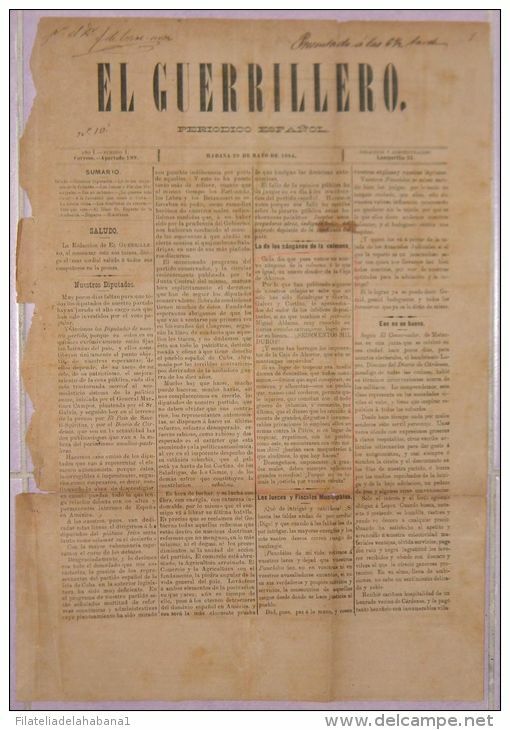 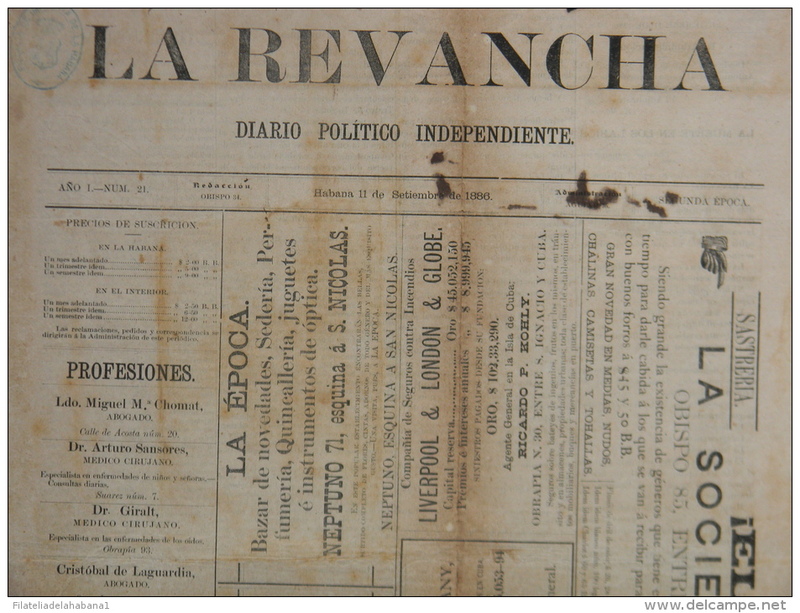 BP201 CUBA SPAIN NEWSPAPER ESPAÑA 1886 \"LA REVANCHA\" 4/09/1886. 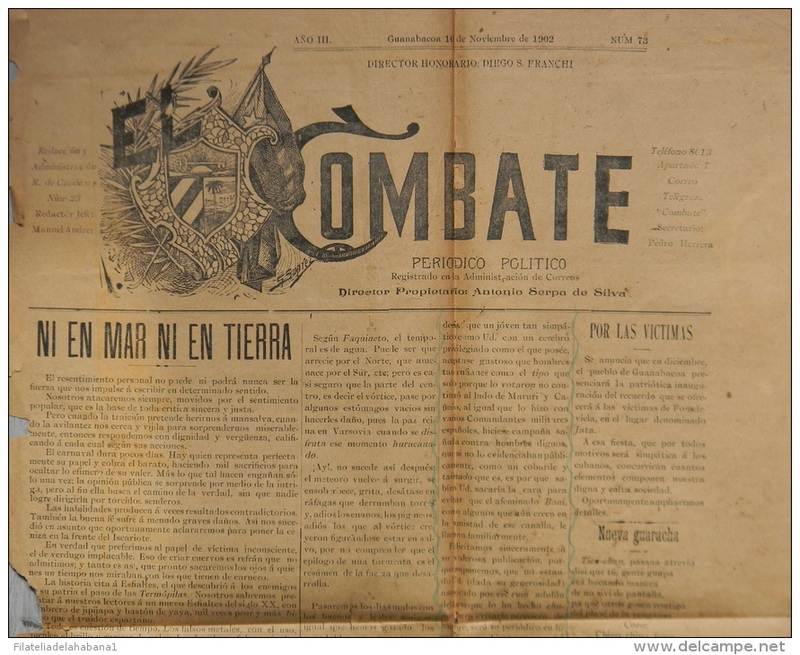 56X37cm. 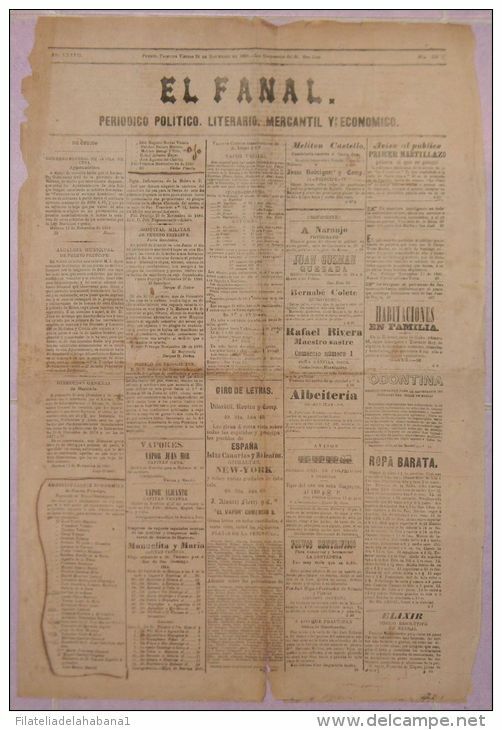 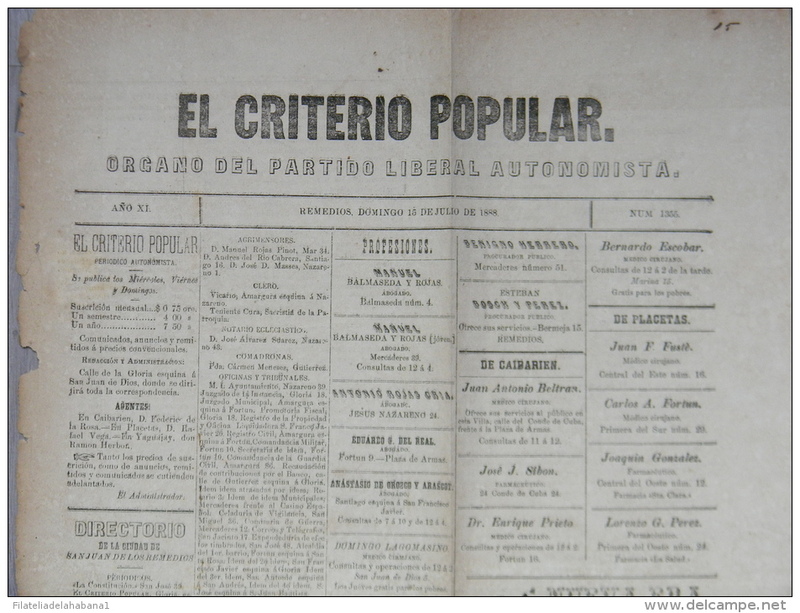 BP200 CUBA SPAIN NEWSPAPER ESPAÑA 1888 EL CRITERIO POPULAR 15/07/1888. 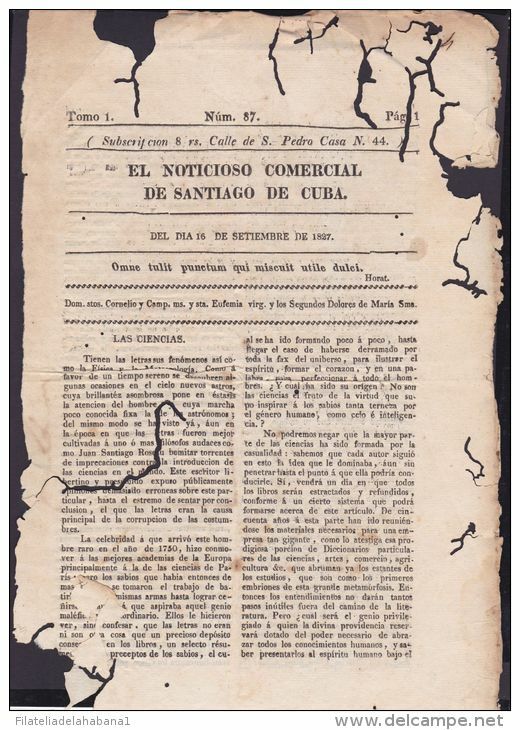 56X37cm. 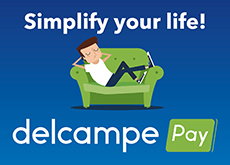 There are 1179 items which correspond to your search on Delcampe International.